A native of Connecticut, Quinn pursued a bachelor of arts degree from Providence College where he was the recipient of the Leo S. Cannon award for superior achievement in the music field. He went on to earn his masters degree with honors from the Manhattan School of Music, studying conducting with David Gilbert and voice with highly acclaimed Metropolitan Opera singer Mark Oswald. He completed his doctorate at the University of Southern California’s Thornton School of Music, where he studied conducting with Larry Livingston and Jo-Michael Scheibe and was awarded the outstanding doctoral graduate of his class. Quinn has participated in numerous masterclasses as a conducting fellow, attending conducting institutes at the Royal Academy of Music, Eastman School of Music, and Bard Conservatory of Music. He has been mentored by such renowned conductors as Benjamin Zander, Neil Varon, and Leon Botstein. 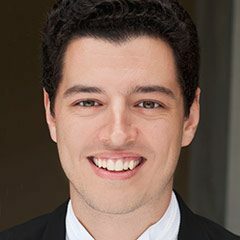 Quinn serves on the conducting faculty at the University of Southern California’s Thornton School of Music and has previously served as a faculty member at Providence College.